Prior to this whole 'mom life' believe it or not I was one heck of an entertainer. I mean really! From the invites to decor, drinks, down to the whole event! I loved it. Loved it so much that I actually did it almost monthly in some way. Whether having my girlfriends coming over or couples and even family. I loved to entertain! Fast forward to oh... TODAY. Or really right after moving to Philadelphia. I just kind of put all those once important things aside. Why? Because my house was taken over by rugrats. You think I'm kidding ?!!?! ha. I'm not. The LAST thing I wanted was to have to hide the toys that weere all over the floor, in the kitchen, even in the dishwasher!!! Toys. Dirty boys and a house full of toys pretty much puts a damper on all things fun! ha. Well... it really just becomes a 'different' kind of fun. Different priorities. Events or event planning has become a thing of the past outside of birthday parties or holidays where I pick up already cooked meals, toss them in the oven and voila. So, a couple weeks ago I was invited to an amazing event being put on by the MEGA talented Nicole Feliciano from MomTrends. I'm a HUGE fan of hers. She introduced me to the awesomeness of Stokke. Plus, everything I've ever been to of hers has been outstanding!! Elizabeth with Party BluprintsSo, I was invited to a Southern Luncheon at a beautiful estate in Atlanta. 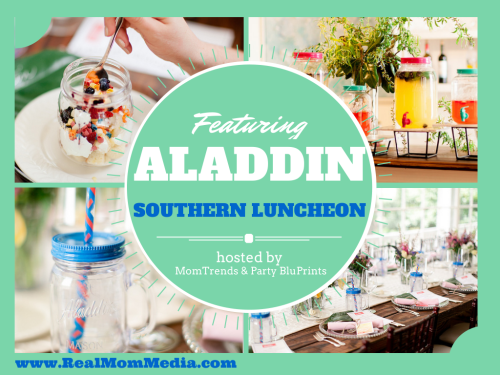 My dear friends Dawn & Elizabeth from Party BluPrints were also apart of the event and I knew I just had to fly in a day early so that I was up, refreshed and ready to rock the luncheon put on by Aladdin. Now, mind you. I was secretly vying to feel a sense of motivation to host parties again. It's kind of fell out of my vocabulary or thought process event. And as much as I love these ladies - they make it look soooo easy! Upon arrival I felt the sense of pure southern hospitality take over me. I went to college in Kentucky and have always had a heart for the country. You can take the girl out of the country but you can't take the country out of the girl, ya know? Good news is that I didn't plop out in some frumpy outfit. I actually had a fab time the day before shopping till I dropped (LITERALLY) at the Fipps Mall next to the hotel. When you walked in there were big Alladin pitchers filled with amazing tasty drinks. Cucumber Mint water, Strawberry Lemonade and so many more. If I wasn't in such a 'dainty atmosphere' I could have EASILY turned my head upside down on those pitchers!! ha. I know. Highly appropriate? No. Anyway, the settings for the lunch were amazing. Dawn & Elizabeth do an outstanding job setting up gorgeous settings. The flowers were fab all the way down to the service! Very nice crew. Being around amazing women I consider peers was a dream too! Alladin, MomTrends & Party Bluprints did an outstanding job conveying some good old country classics in their event. We even brought home a tasty rub for cooking ourselves! What is your favorite things to fill up a good old Aladdin Mason jar?